This is the location of Relay # 4. These are wire relays - very fast, maybe not very robust? Do you think Ron Williams is buying what Frank King is saying? 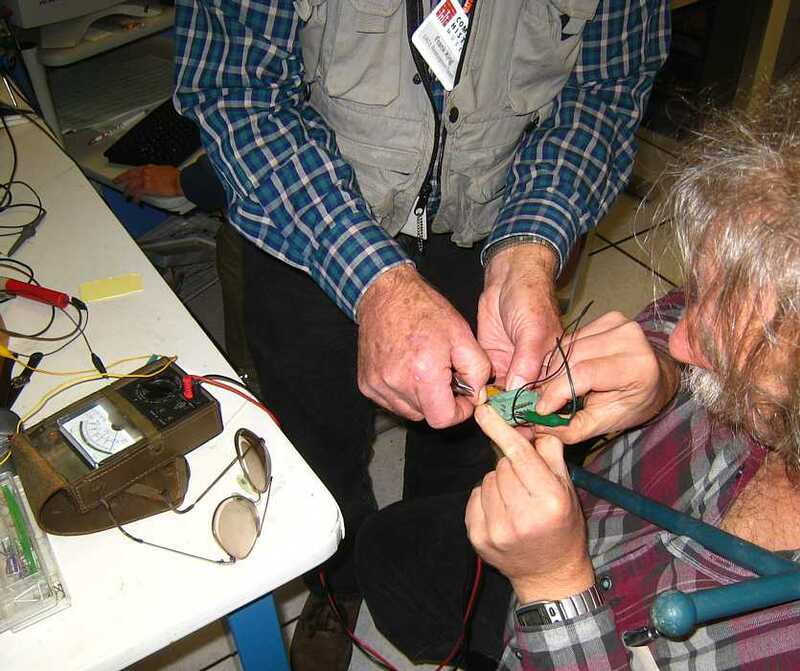 A close up of the suspect Frank King [left] and Jim Hunt are using that period volt-ohm meter to test contact resistance. (One contact was one ohm higher than the others - is that bad??) Well, who knows? We tagged and bagged it for replacement of the wires. The CT card reader is 'fixed', at least temporarily. 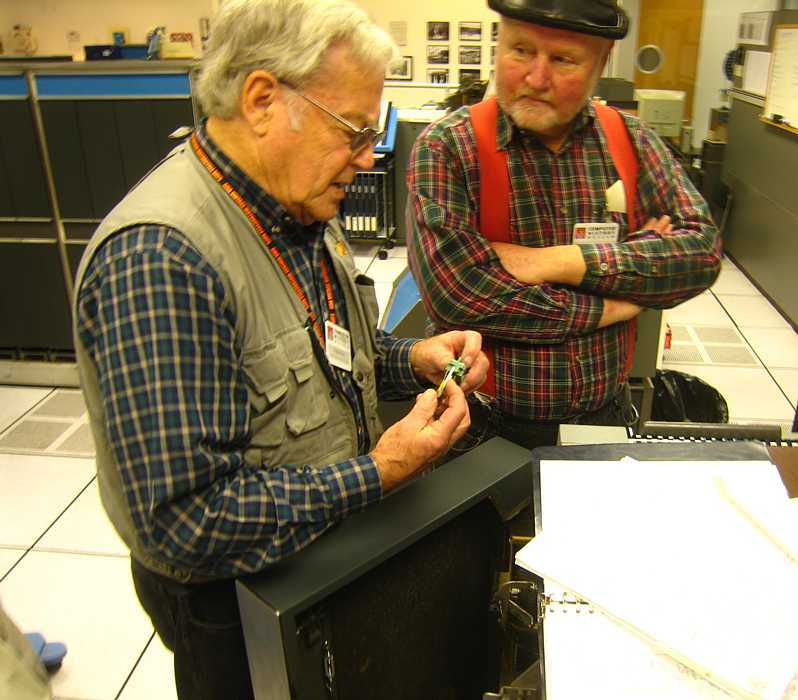 Here Robert Garner is holding a recording device recording the radio activated by electrical noise from the CT 1401. 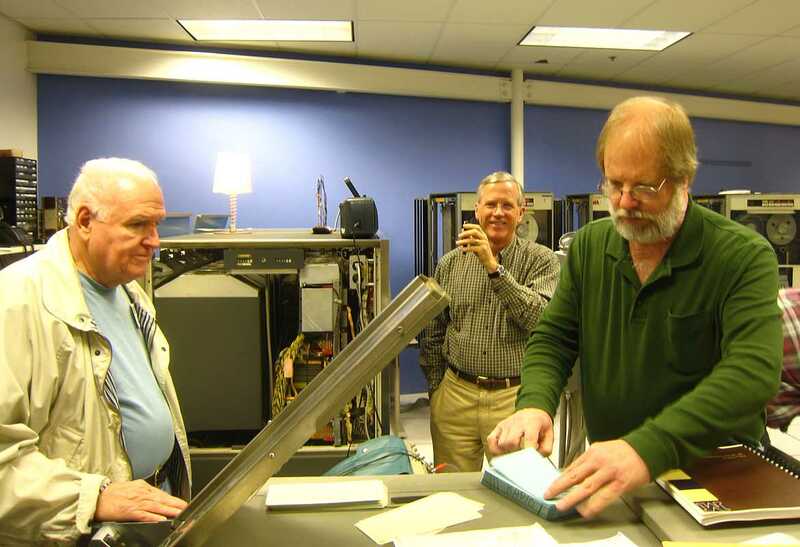 Bill Flora is feeding cards into the Ct 1402 card reader, and Bob Feretich is handling one of 24 "songs". "The German machine was running like a champ when I left on Wednesday. We found (and replaced) a card with a dead input diode in the timing circuitry. 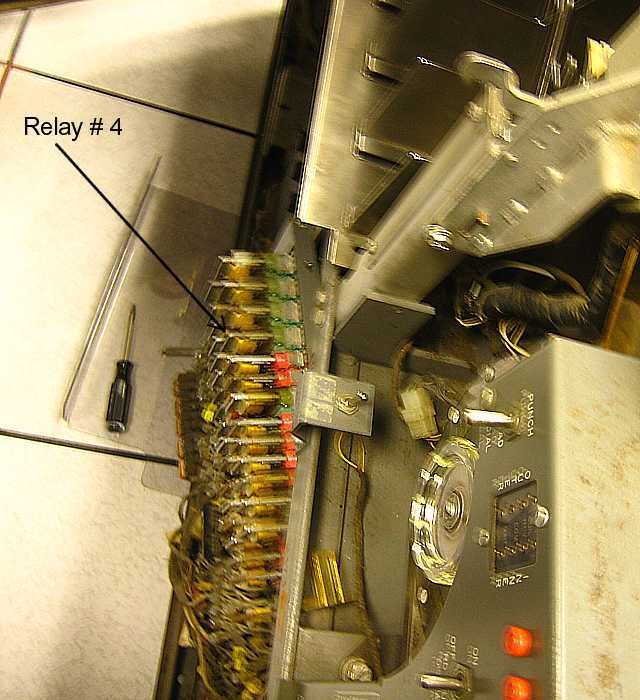 It was generating too wide of a clock phase pulse that caused a reset glitch that impacted reader and punch operations." 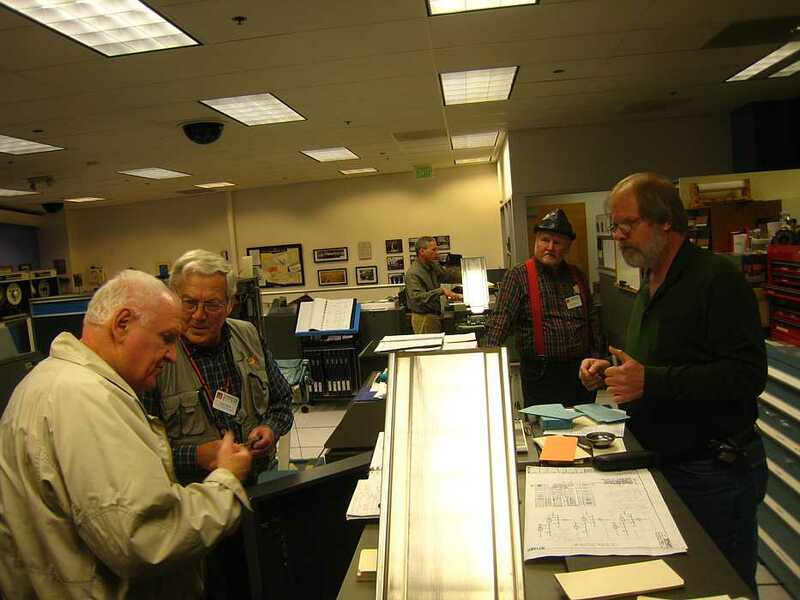 "The reason we have two IBM 1401 machines is so we can have one up for demonstrations if one goes down. When in Storage Scan. lifting the store lever does a full scan without pressing start. Full memory scan will cause a print check." Oh Dear - can it get any worse????? Is it true your day is done? Our compusaurs again can run! I am so glad that Van Snyder didn't bother !! He is even worse than badder. Which 16K could barely hold her. Word marks, zone bits, BCD. Load registers A and B. The more I code her, the more I feel older. I used to crank out awful limericks by the dozen in junior high school. OK, ok, I'll stop now. Maybe do Haiku next. Robert Garner (and bagels) were not present. Robert had e-mailed something about a "customer visit". I responded that customers, like calories, don't count, ;-)) but Robert didn't show up anyway. So, he suggested that I check out the differential 18 volts, while he did a memory scan with tooth picks forcing the "START" and "ERROR RESET" buttons to remain in - talk about tricks of the trade !! You start by assuring that the 30 volt supply is proper, then make sure that the differential 18 volt output, about the same but different from the 12 volt supply, is proper. Depending upon the machine, the differential 18 volts might work the memory best +- 1 volt. I (Ed) did the above, but the error pulses feeding the error light continued - slightly less at 19 volt differential, but that was out of spec - something else was wrong. We then hung a scope on the output of one of the sense amps, and watched the difference of outputs with different addresses. Same amplifier, different addresses ?!?! We then found that rattling a fingernail along a row of cards caused "Bad" to go "OK" or back again - but the effect could not be localized ?!?! And when starting the test from power up, the "Bad" signal started from low (about 1/2 full amplitude) to full amplitude in about a second ?!?! When I mentioned that when taking apart the circuit breakers spring loaded parts tended to fly about unpredictably - Joe said that when you get one surface off about 1/4 inch, put in some scotch tape to hold things together. 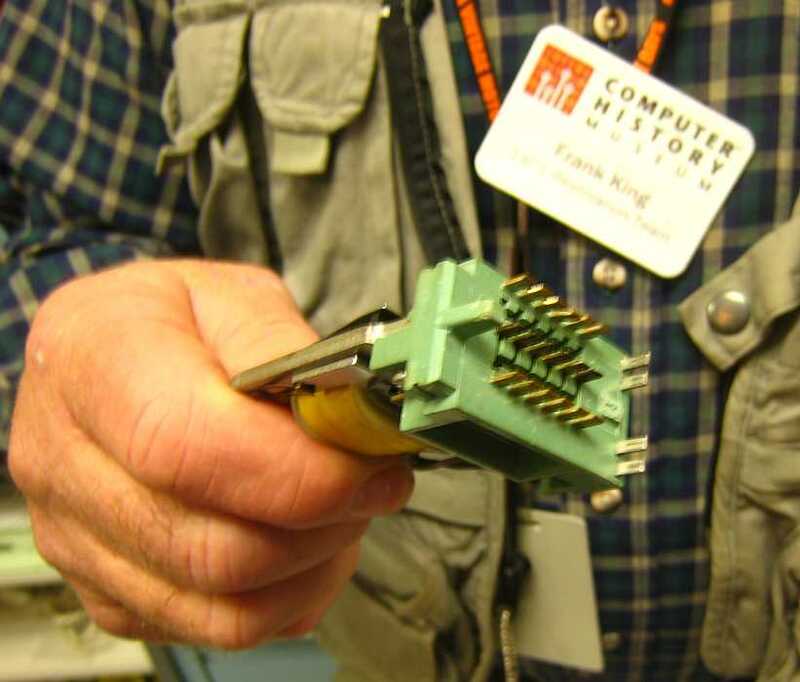 We really wanted a current probe - hoping to find a non-standard current in some of the memory switch cores - which drive the X, Y, and Inhibit lines. Jim Hunt, our ace card fixer, mentioned that he has a promising interview coming up, as well as a likely job offer.
" The distraction was the AQU cards, we chased down and found the vibration sensative bug. It was a leaky current driver in one of the AQU cards. All better now. "I did find that the dual power supply is having trouble maintaining 30V, do we have any support contract deal on our test equipment, it needs some TLC?"